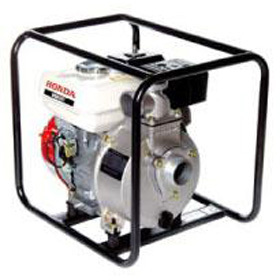 These petrol driven self primming water pumps are the most common type used for in constuction and building sites and used to move large volumes of water very quickly. They work well with water over 150mm deep and will lift upto 6mtrs by sucking water up its suction intake hose. Classed as fresh water pump it will cope with muddy waters where solid are desolved in the water .It comes with a 5 mtr suction/ 10 mtr discharge hose. This pump is very compact and will fit into a small hatch back car but the suction hose more space ie 3ft diameter. Fitted with either a robin or honda engine.